Is there nothing craft can’t fix? Exhibit ‘A’ is this dull grey cardy with not much going for it. Mix a bit of craft magic and you’ve got a one off piece that’s suddenly got some balls. 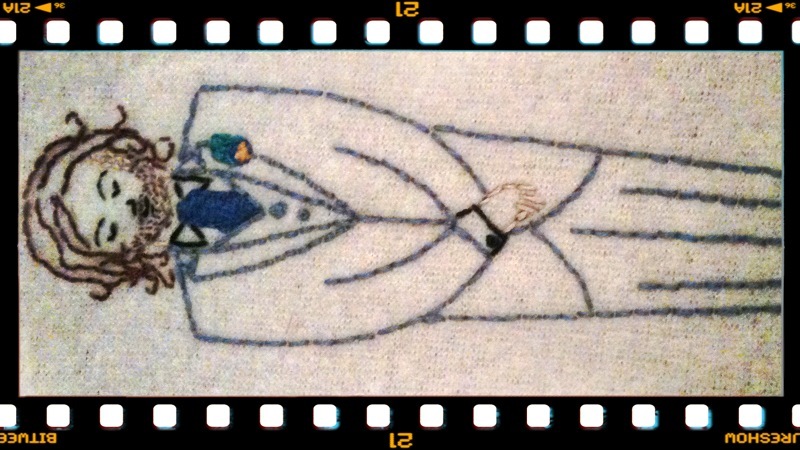 This is another example of the Sublime Stitching patterns (which I reviewed here) put to good use. A great bonus is that it can be done in just one evening. I gave the stretchy fabric extra strength by ironing Wonderweb onto the back of the area I wanted to stitch, this made sewing neat stitches much easier. 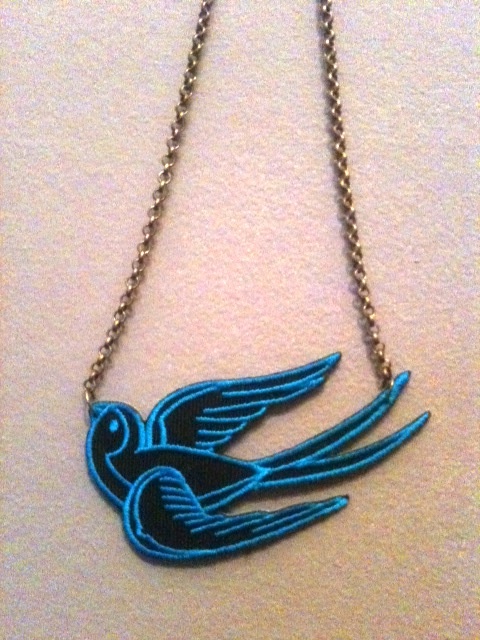 I think this looks great with colour-pop accessories that pick out the colours of the embroidery. My favourite way to wear it is with a yellow belt, yellow heels, a red ring, navy pencil skirt and a stripy top. 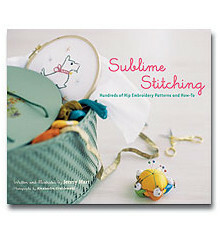 Seeing as I heart Sublime Stitching so much and embroider quite a lot of their patterns, I thought it was about time I reviewed one of their books. If you’re not familiar with Sublime Stitching, get Googling quick! The head honcho, Jenny Hart is an inspirational crafter and luckily for fans she produces a large range of iron-on embroidery designs so everyone can have a go. Each sheet in this book has a number of designs (often larger or smaller versions of the same image so you can choose your size). Each sheet of images is protected by another page so the designs don’t transfer onto each other. You simply cut out the image and iron on — but don’t take my word for it, the book has full instructions including lessons on a range of stitches such as feather, chain and satin. For the beginner, these instructions are great — they’re clear but not patronising and Jenny’s style of writing is always fun and welcoming. The spiral binding makes it easy to use and there are useful pockets at the front and back to store the designs once you’ve cut them out to use them. (The only annoyance is there are so many they won’t all fit). Reading other reviews, some people were disappointed by what they thought was a lack of new designs. It’s true that Jenny has produced many similar books and if you already have one or two you’re likely to see familiar images, but in my view there is enough to keep me busy and happy for a long time. 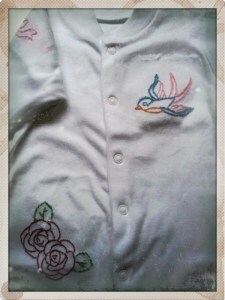 Here’s an example of the bird and a rose, which I sewed onto a babygrow. I’ve also sewn Jenny’s cat designs on other babygrows; the bird onto a fabric envelope and lots more designs onto an embroidered patchwork baby blanket, which I will post on soon! 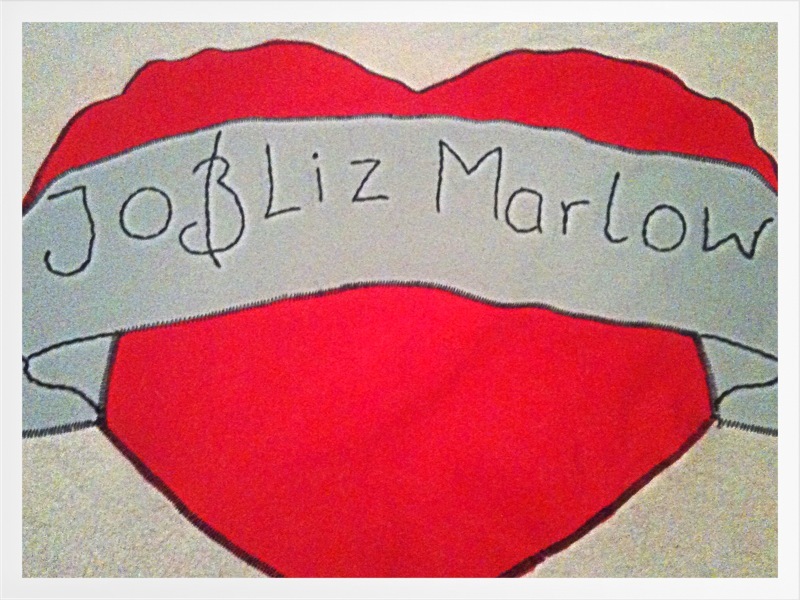 I was a bit sad to hand over the love blanket (yes, I named it. Yes, we bonded) but I hope that’s the sign of it being a good present. 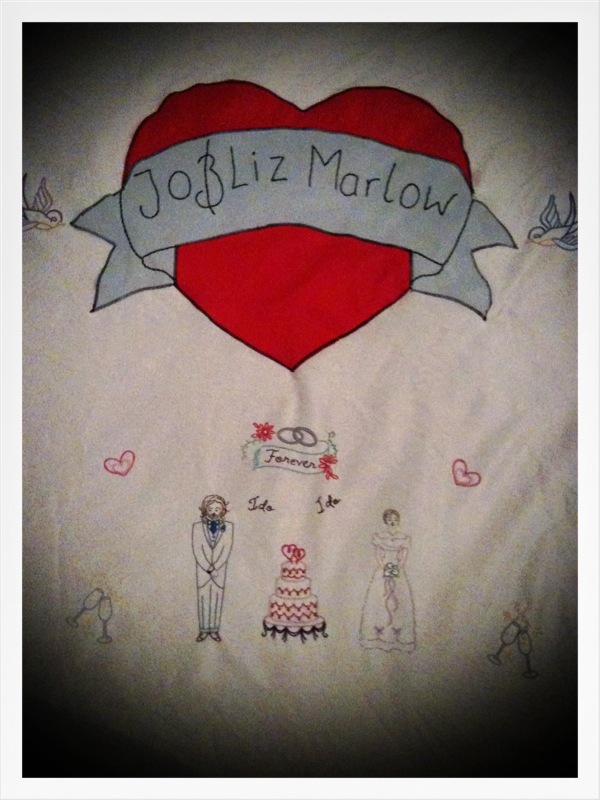 I gave this to some lovely friends of mine on their wedding day, they had asked for a donation to their honeymoon fund (Thailand. Three weeks. Lucky buggers), which I happily obliged with but wanted to do something extra that was heartfelt but not budget-busting. 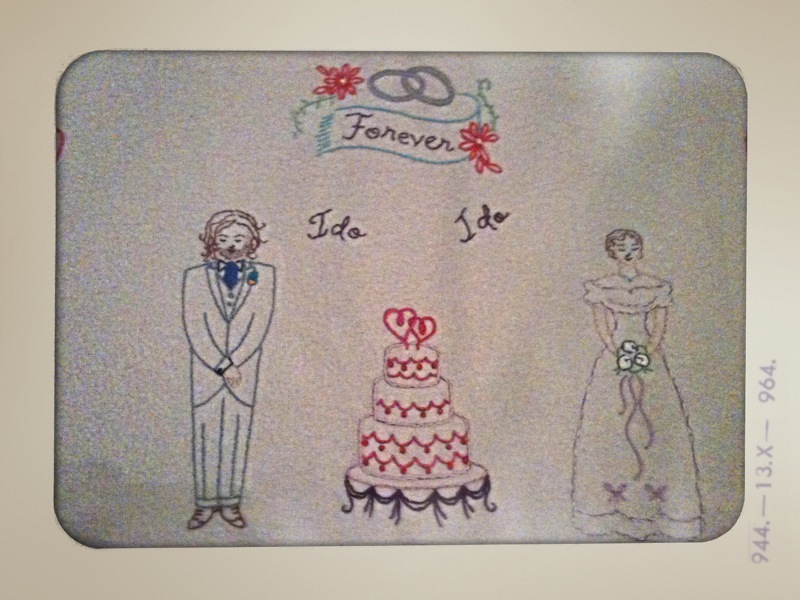 All of the embroidery designs were from an iron-on kit by Sublime Stitching, which costs $5 and has full instructions. I also bought some felt for the appliqué heart and used embroidery threads that I already had, so in total it was a pretty inexpensive gift. They seemed to like it and have decided to hang it on their wall. I was thinking it would only be used on the occasional winter night or for movie watching so I’m happy, though I did have a romantic notion of their not-yet-conceived kids snuggling underneath it, so I hope it makes it down eventually. I have a crochet blanket made by my great-grandmother, which I snuggled under for comfort when I was ill – it is called the sick blanket (don’t worry, it was never covered in sick). It was, and still is, a very special blanket and I had that in mind when I made this. I chose an appliqué heart and ribbon and embroidered swallows to ‘hold’ them, partly because I’m into tattoo designs and because they’re a young and trendy couple, so I thought they’d enjoy it. 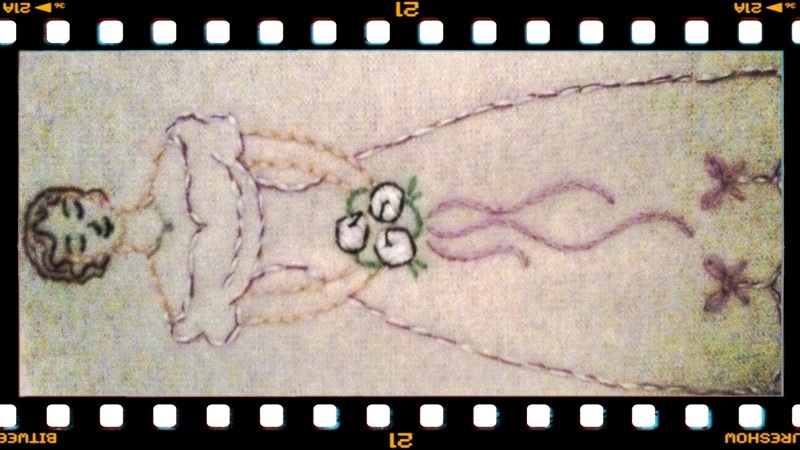 I machine-sewed the heart and ribbon with a secure zig-zag stitch and then trimmed any edges. 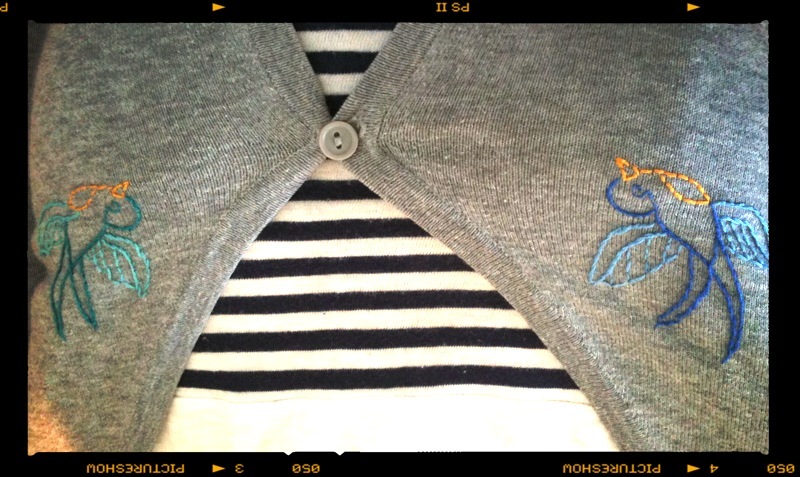 It took a fair while to embroider this but it was a lovely project to work on. I even took it in the bus to sew on the way to work (I live in London so it’s always a long and public commute). As it was winter it kept me nice and snug as I sewed! 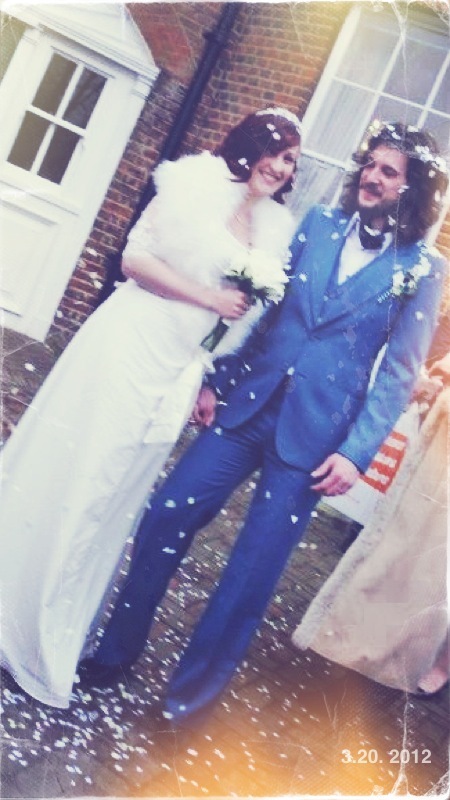 Here’s the couple on their beautiful day – they make quite a dapper pair, don’t they? You’ll see that the wedding dress is different to what I embroidered as, quite rightly, that was all kept secret until the day, but I was lucky enough to catch a look at the groom’s outfit before as he needed me to take up the trouser hem. The heart matched the homemade fascinator I wore on the day too! 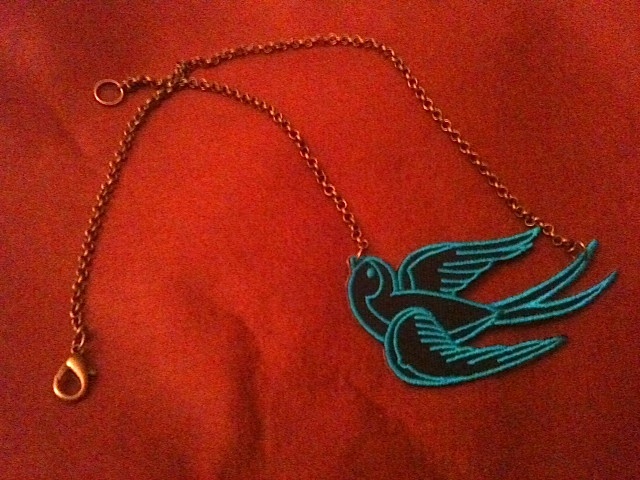 It was an incredibly beautiful day and I’m really pleased to have made a special keepsake for them.